For the 1988 comedy film, see The Blue Iguana. For the 2018 Sam Rockwell film, see Blue Iguana (film). Not to be confused with caimans (a kind of crocodilian) or caiman lizards (a kind of lizard). The blue iguana (Cyclura lewisi), also known as the Grand Cayman ground iguana, Grand Cayman blue iguana or Cayman Island rock iguana, is an endangered species of lizard endemic to the island of Grand Cayman. Previously listed as a subspecies of the Cuban iguana (Cyclura nubila), it was reclassified as a separate species in 2004 because of genetic differences discovered four years earlier. The blue iguana is one of the longest-living species of lizard (possibly up to 69 years). The preferred habitat for the blue iguana is rocky, sunlit, open areas in dry forests or near the shore, as the females must dig holes in the sand to lay eggs in June and July. A possible second clutch is laid in September. The blue iguana's herbivorous diet includes plants, fruits, and flowers. Its coloration is tan to gray with a bluish cast that is more pronounced during the breeding season and more so in males. It is large and heavy-bodied with a dorsal crest of short spines running from the base of the neck to the end of the tail. The fossil record indicates that the blue iguana was abundant before European colonization; but fewer than 15 animals remained in the wild by 2003, and this wild population was predicted to become extinct within the first decade of the 21st century. The species' decline is mainly being driven by predation by feral pets (cats and dogs) and indirectly by the destruction of their natural habitat as fruit farms are converted to pasture for cattle grazing. Since 2004, hundreds of captive-bred animals have been released into a preserve on Grand Cayman run by a partnership headed by the Durrell Wildlife Conservation Trust, in an attempt to save the species. At least five non-profit organizations are working with the government of the Cayman Islands to ensure the survival of the blue iguana. According to the November 9, 2013 episode of Ocean Mysteries with Jeff Corwin, the conservancy program has released over 700 captive bred Grand Cayman blue iguanas since the 2004 nadir of only 12 remaining animals. The blue iguana (Cyclura lewisi ) is endemic to the island of Grand Cayman. The Lesser Caymans iguana has been introduced to Grand Cayman, where it has interbred with that island's native blue iguana. Its generic name (Cyclura) is derived from the Ancient Greek words cyclos (κύκλος) meaning "circular" and ourá (οὐρά) meaning "tail", after the thick-ringed tail characteristic of all Cyclura. Its specific name (lewisi) is a Latinized form of the name of the scientist who collected the holotype of this species, Charles Bernard Lewis. 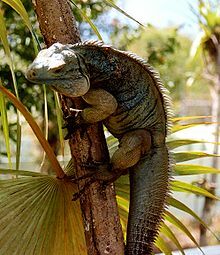 Its closest relatives are the Cuban iguana (Cyclura nubila) and the Northern Bahamian rock iguana (Cyclura cychlura), the three species having diverged from a common ancestor some three million years ago. The species has a low genetic diversity but does not seem to suffer the same lack of vitality that afflicts other such species of rock iguana. One theory is that the species evolved from a single female Cuban iguana (C. nubila nubila) with eggs inside her who drifted across the sea, perhaps during a storm. It is distinct from the subspecies found on Little Cayman and Cayman Brac known as C. nubila caymanensis, although it can breed with this subspecies and produce fertile offspring. In 1938, C. Bernard Lewis of the Institute of Jamaica joined an Oxford University biological expedition to the Cayman Islands. Lewis was able to obtain two blue iguanas, a male and a female, which were later lodged with the British Museum of Natural History. Chapman Grant, in a monograph published in 1940, formally described the blue iguana for the first time as Cyclura macleayi lewisi. Schwartz and Carey established the trinomial (Cyclura nubila lewisi ) in 1977. They held that the blue iguana was a strongly distinct subspecies of the Cuban iguana (C. nubila), the species which it evolved from and can breed with. They emphasized its overall bright blue coloration, and noted that further study could reveal it to be a distinct species. Frederick Burton reclassified the blue iguana as a distinct species in 2004, after years of research comparing scale counts on the heads of Caribbean iguanas, including those found on Little Cayman, Cayman Brac, Cuba, and the Bahamas, as well as mitochondrial DNA analysis performed by Dr. Catherine Malone, to re-examine the phylogeography of the different species. The blue iguana is the largest native land animal on Grand Cayman with a total nose-to-tail length of 5 ft (1.5 m) and weighing as much as 30 lb (14 kg). It may be the heaviest species of iguana and most massive lizard in the Western Hemisphere. Its body length is 20–30 inches (51–76 cm) with a tail equal in length. The blue iguana's toes are articulated to be efficient in digging and climbing trees. Although not known to be arboreal, the blue iguana has been observed climbing trees 15 feet (4.6 m) and higher. The male is larger than the female by one third of his body size. The mature male's skin color ranges from dark grey to turquoise blue, whereas the female is more olive green to pale blue. Young animals tend to be uniformly dark brown or green with faint darker banding. When they first emerge from the nest the neonates have an intricate pattern of eight dark dorsal chevrons from the crest of their necks to their pelvic area. These markings fade by the time the animal is one year old, changing to mottled gray and cream and eventually giving way to blue as adults. The adult blue iguana is typically dark gray matching the karst rock of its landscape. The animal changes its color to blue when it is in the presence of other iguanas to signal and establish territory. The blue color is more pronounced in males of the species. Their distinctive black feet stand in contrast to their lighter overall body color. Blue iguanas are sexually dimorphic; males are larger and have more prominent dorsal crests as well as larger femoral pores on their thighs, which are used to release pheromones. The blue iguana's eyes have a golden iris and red sclera. They have excellent vision, which allows them to detect shapes and motions at long distances. As blue iguanas have only a few rod cells, they have poor vision in low-light conditions. At the same time, they have cells called "double cones" which give them sharp color vision and enable them to see ultraviolet wavelengths. This ability is useful when basking so the animal can ensure that it absorbs enough sunlight in the forms of UVA and UVB to produce vitamin D.
The blue iguana is found only on the island of Grand Cayman. Comparison with other Cyclura species in the region strongly suggests that there was once a coastal population of blue iguanas which was gradually displaced or extirpated by human settlements and the construction of roads.The blue iguana now only occurs inland in natural xerophytic shrubland and along the interfaces between farm clearings, roads, and gardens and closed-canopy dry forest or shrubland.The interior population is believed to have been attracted to agricultural clearings and fruit farms which provide thermoregulatory opportunities, herbaceous browse, fallen fruit, and nesting soil, but this brought the blue iguana into contact with humans and feral animals. Females often migrate to coastal areas to nest. Blue iguanas released into the Queen Elizabeth II Botanic Park on Grand Cayman were radiotracked in 2004 to determine ranges for each animal. Females were found to occupy territories of 0.6 acres (2,400 m2) and males an average of 1.4 acres (5,700 m2) with overlap in common territories, indicating that they choose to maintain a population density of four to five animals per hectare. The blue iguanas occupy rock holes and tree cavities, and as adults are primarily terrestrial. Younger individuals tend to be more arboreal. Hatchlings are preyed upon by the native snake Alsophis cantherigerus. The adults have no natural predators but can fall victim to feral dogs. They typically reach sexual maturity at three to four years of age. The blue iguana is listed as endangered on the IUCN Red List. The population is restricted to the eastern interior of Grand Cayman, where it had been reduced to a critically low level, only three animals having been observed before the survey in 1988. The range of the blue iguana has contracted significantly over the past 25 years, with many sites once populated now showing no signs of iguanas. Surveys in 2003 indicated a total population in the range of 5–15 individuals. By 2005 the unmanaged wild population was considered to be functionally extinct. The species is one of the most endangered animals on Earth. A further blow to the dwindling population came in May 2008 when six individuals were found butchered in a nature preserve. As the blue iguana consumes a variety of plant material, favoring fruits and flowers over leaves and stems when available, it is valuable on Grand Cayman as a seed disperser throughout its range. A study in 2000 by Dr Allison Alberts revealed that seeds passing through the digestive tracts of Cycluras germinate more rapidly than those that do not. These seeds in the fruits consumed by the blue iguana have an adaptive advantage by sprouting before the end of very short rainy seasons. The blue iguana is an important means of distributing seeds to new areas and, as the largest native herbivore of Grand Cayman's ecosystems, it is essential for maintaining the delicate balance between climate and vegetation necessary to survive under harsh conditions. Restored free-roaming subpopulations in the Queen Elizabeth II Botanic Park and the Salina Reserve numbered approximately 125 individuals in total after an initial release in December 2005. The restored subpopulation in the Queen Elizabeth II Botanic Park has been breeding since 2001, and the subpopulation in the Salina Reserve was deemed to be breeding in 2006 after a nest of three hatched eggs was discovered in the wild. As of April 2007, after another large-scale release, there were 299 blue iguanas living in the wild, with hundreds more being raised in captivity on Grand Cayman. In late 2012, the blue iguana Recovery Program estimated that the wild population had risen to approximately 750 individuals, and the IUCN subsequently downlisted the species from critically endangered to endangered. Habitat destruction is the main factor threatening imminent extinction for this iguana. Land clearance within remnant habitat is occurring for agriculture, road construction, and real estate development and speculation. The conversion of traditional crop lands to cattle pasture is eliminating secondary blue iguana habitat. Blue iguanas used to regularly be sold to tourists as pets, as their rarity made them appealing to exotic-animal collectors, despite this being illegal under the CITES treaty. In 1999 a World Wildlife Fund international conservation officer, Stuart Chapman, said, "The British government has turned a blind eye for over 20 years to these overseas territories which are home to many rare and endangered species. Many of these face extinction if Britain fails to honour its treaty obligations. The British Caribbean islands are extremely rich in biodiversity with many critically endangered species that are unique to the islands—yet there is virtually zero enforcement or implementation of CITES". In 1990, the American Zoo and Aquarium Association (AZA) designated the genus Cyclura as their highest priority for conservation. Their first project was an in situ captive breeding program for the blue iguana, which at the time was the most critically endangered of all the species of Cyclura. The Blue Iguana Recovery Programme grew from a small project started in 1990 within the National Trust for the Cayman Islands. It is now a partnership, linking the Trust with the Cayman Islands Department of Environment, National Trust Cayman Islands, Queen Elizabeth II Botanic Park, Durrell Wildlife Conservation Trust, International Reptile Conservation Foundation, IRCF, and the European Commission. This program operates under a special exemption from provisions in the Animals Law of the Cayman Islands, which normally would make it illegal for anyone to kill, capture, or keep iguanas. BIRP's conservation strategy involves generating large numbers of genetically diverse hatchlings, head-starting them for two years so that their chance of survival in the wild is high, and using these animals to rebuild a series of wild sub-populations in protected, managed natural areas. This is accompanied by field research, nest site protection, and monitoring of the released animals. A rapid numerical increase from a maximum possible number of founding stock is sought to minimize loss of genetic diversity caused by the "population bottleneck". Breeding of blue iguanas in the wild will require indefinite future management. To sustain this activity, a range of commercial activities generates the funding required, while an ongoing education and awareness effort ensures continued involvement and support by the local community. In April 2019, one iguana laid 18 eggs for possible hatching. Any survivals will be the first successful breeding since 2015. In 2018, seven eggs were laid but none hatched. ^ a b c d e f g h i j k l m Burton, F.J. (2012). "Cyclura collei". IUCN Red List of Threatened Species. Version 2006. International Union for Conservation of Nature. Retrieved June 10, 2012. ^ Schwartz A, Thomas R (1975). A Check-list of West Indian Amphibians and Reptiles. Carnegie Museum of Natural History Special Publication No. 1. Pittsburgh, Pennsylvania: Carnegie Museum of Natural History. 216 pp. (Cyclura nubila lewisi, new combination, p. 113). ^ Species Cyclura lewisi at The Reptile Database . www.reptile-database.org. ^ a b c d Kenyon, Georgina (2005-05-23). "SOS call for ancient blue iguana". BBC News. Retrieved 2008-03-16. ^ Sanchez, Alejandro. "Family Iguanidae: Iguanas and Their Kin". Father Sanchez's Web Site of West Indian Natural History Diapsids I: Introduction; Lizards. Kingsnake.com. Retrieved 2007-11-26. ^ a b Beolens, Bo; Watkins, Michael; Grayson, Michael (2011). The Eponym Dictionary of Reptiles. Baltimore: Johns Hopkins University Press. xiii + 296 pp. ISBN 978-1-4214-0135-5. (Cyclura lewisi, p. 157). ^ a b c d e f "Blue Iguanas get helping hand to recovery". Cayman Net News. 2005-04-26. Archived from the original on 2008-02-05. Retrieved 2008-03-15. ^ a b Kenyon, Georgina (2005-09-17). "Pulling the blue iguana from the brin". New Scientist. Simone Coless (2517): 42–43. ^ a b c Hudson, Rick (2007-04-01). "Big Lizards, Big Problems". Reptiles Magazine. 15 (4): 54–61. ^ a b Malone, Catherine; Davis, Scott (2004). Genetic Contributions to Caribbean Iguana Conservationz. Iguanas: Biology and Conservation. University of California Press. pp. 54–57. ISBN 978-0-520-23854-1. ^ a b c d e f Burton, Frederick (2004). "Taxonomic Status of the Grand Cayman Blue Iguana" (PDF). 8 (1). Caribbean Journal of Science: 198–203. Retrieved 2007-09-16. ^ a b "Green and Blue a world of difference to Iguanas". Cayman Net News. 2006-02-14. Archived from the original on 2008-02-05. Retrieved 2008-01-15. ^ a b Grant, Chapman (1940). "The Herpetology of the Cayman Islands". 2. Bulletin Institute of Jamaican Science: 1–55. ^ a b c Hollingsworth, Bradford D. (2004). The Evolution of Iguanas an Overview and a Checklist of Species. Iguanas: Biology and Conservation. University of California Press. pp. 35–39. ISBN 978-0-520-23854-1. ^ a b c d e De Vosjoli, Phillipe; David Blair (1992). The Green Iguana Manual. Escondido, California: Advanced Vivarium Systems. ISBN 1-882770-18-8. ^ a b c d Dorge, Ray (1996). "A Tour of the Grand Cayman Blue Iguana Captive-Breeding Facility". Reptiles: Guide to Keeping Reptiles and Amphibians. 4 (9): 32–42. ^ ADW: Cyclura nubila lewisi: INFORMATION. Animaldiversity.ummz.umich.edu. Retrieved on 2012-12-19. ^ a b c d e f g h i j k l m n o p q r Blair, David (1991). 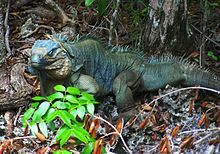 "West Indian Iguanas of the Genus Cyclura: Their Current Status in the Wild, Conservation Priorities and Efforts to Breed Them in Captivity" (PDF). SE (6). Northern California Herpetological Society: 55–56. Archived from the original (PDF) on 2008-04-11. Retrieved 2008-03-15. ^ a b c d e f Winker, Carol (2007-02-08). "Iguanas get royal attention". Caymanian Compass. Retrieved 2008-03-15. ^ a b c d e Burton, Fred (2004). "Color and Pattern in Grand Cayman Blue Iguanas". Iguana Journal of the International Iguana Society. 11 (3): 148–151. ^ a b c d e Brames, Henry (2007). "Aspects of Light and Reptile Immunity". Iguana: Conservation, Natural History, and Husbandry of Reptiles. International Reptile Conservation Foundation. 14 (1): 19–23. ^ Burton, Frederic (2005). "Salina Blues Update" (PDF). Blue Iguana Tales. Quarterly Update on Blue Iguana Recovery Project. 3 (4): 5. Retrieved 2008-03-15. ^ a b Burton, Fred (2006). "Blue Iguana Recovery Program: Iguana Specialist Group Meeting". Iguana: Journal of the International Iguana Society. 13 (2): 117. ^ a b c d e f g h i j k l m n o p q r s t u Alberts, Allison (2001). "Species Recovery Plan 2001 – 2006 for the Grand Cayman Blue Iguana, Cyclura nubila lewisi" (PDF). The Grand Cayman Blue Iguana – Species Recovery Plan 2001–2006. Grand Cayman: Blue Iguana Recovery Program. p. 29. ^ a b c Hazard, Lisa C. (2004). Sodium and Potassium Secretion by Iguana Salt Glands. Iguanas: Biology and Conservation. University of California Press. pp. 84–85. ISBN 978-0-520-23854-1. ^ a b Adams, Colette (2004-09-01). "Requiem for Godzilla". Iguana: Journal of the International Iguana Society. 11 (3): 168–172. ^ a b c Adams, Colette (2004-05-26). "Obituary" (PDF). Iguana Specialist Group Newsletter. 7 (1): 2. Retrieved 2008-03-15. ^ Iverson, John; Smith, Geoffrey; Pieper, Lynne (2004). Factors Affecting Long-Term Growth of the Allen Cays Rock Iguana in the Bahamas. Iguanas: Biology and Conservation. University of California Press. p. 184. ISBN 978-0-520-23854-1. ^ Blair, David (1983). "Dragons of the Cayman: Rock Iguanas Cling to their Islands". Oceans Magazine. 16 (1): 31–33. ^ a b c d e f g h Burton, Frederic (2007-04-01). "How to Save a Species:Grand Cayman Blues". Reptiles Magazine. 15 (4): 60. ^ a b Wissman, Margaret (1995). "In Search of the Grand Cayman Blue Rock Iguana". Reptiles. 3 (2): 56–57. ^ a b c "Hatchlings revive rarest lizard on earth". The Independent. 2006-10-26. p. 28. ^ "Rare Blue Iguanas Found Butchered". National Geographic. 2008-05-06. Retrieved 2008-05-08. ^ a b c d e Alberts, Allison; Lemm, Jeffrey; Grant, Tandora; Jackintell, Lori (2004). Testing the Utility of Headstarting as a Conservation Strategy for West Indian Iguanas. Iguanas: Biology and Conservation. University of California Press. p. 210. ISBN 978-0-520-23854-1. ^ "Breeding Success for Rare Lizards". BBCNews/Science Nature. 2006-10-27. Retrieved 2008-03-15. ^ Grand Cayman Blue Iguana takes step back from extinction Archived 2012-11-11 at the Wayback Machine. IUCN (2012-10-20). Retrieved on 2012-12-19. ^ a b Mani, Bina (2002-07-17). "Wild Blue Iguanas plummeting towards extinction". Blue Iguana Recovery Program. Archived from the original on May 2, 2006. Retrieved 2007-07-09. ^ Seidel, M; Franz, R (1994). Amphibians and reptiles (exclusive of marine turtles) of the Cayman Islands. The Cayman Islands: natural history and biogeography. The Netherlands: Kluwer Academic Publishers. p. 434. ISBN 978-0-7923-2462-1. ^ a b c d "Campaign on to Save Blue Iguanas". Cayman Net News. 2007-08-10. Archived from the original on 2008-04-14. Retrieved 2008-03-29. ^ a b Kenyon, Georgina (2008-05-07). "Probe into giant iguana slaughter". BBC. Retrieved 2008-05-11. ^ a b c d e f g h i j k Hudson, Richard D.; Alberts, Allison C. (2004). The Role of Zoos in the Conservation of West Indian Iguanas. Iguanas: Biology and Conservation. University of California Press. pp. 274–289. ISBN 978-0-520-23854-1. ^ "Iguanas Hatch in Indianapolis". Significant Efforts in Conservation. Association of Zoos and Aquariums. 2002. p. 39. ^ Knapp, Charles R.; Hudson, Richard (2004). Translocation Strategies as a Conservation Tool for West Indian Iguanas. Iguanas: Biology and Conservation. University of California Press. pp. 199–209. ISBN 978-0-520-23854-1. ^ Hudson, Rick (2005). "Anegada Iguanas Released" (PDF). Iguana Specialist Group Newsletter. International Iguana Foundation. 8 (1): 2–4. Retrieved 2007-09-08. ^ Nelson, Robert (Fall 2001). "A Safe Haven for Wildlife: Naval Base Guantanamo Bay Provides Sanctuary for Iguana". Currents: Navy Environmental News. ^ Serey, Alvaro; Young, Kayla (April 12, 2019). "Large blue iguana nest brings promise of healthy hatchlings". Cayman Compass. Retrieved 2019-04-15. Wikimedia Commons has media related to Cyclura lewisi. The Turks and Caicos rock iguana is a species of lizard endemic to the Turks and Caicos islands. This small iguana can reach 30 cm (12 in) and becomes mature at seven years and may live for twenty. A single clutch of up to nine eggs is laid each year, and these take three months to hatch. This iguana is mostly herbivorous, but supplements this by adding some animal matter to its diet. The Lesser Antillean iguana is a large arboreal lizard endemic to the Lesser Antilles. It is one of two species of lizard of the genus Iguana and is in severe decline due to habitat destruction, feral predators, hunting, and hybridization with its sister species, the green iguana. Successful captive breeding of this species has been limited to only two instances as most captive laid eggs tend to be infertile. The Mona ground iguana is a species of Cyclura closely related to the rhinoceros iguana. It is endemic to Mona Island, Puerto Rico and is the largest native terrestrial lizard in Puerto Rico. The Fiji banded iguana is an arboreal species of lizard endemic to some of the southeastern Fijian islands. It is found in Tonga, where it was probably introduced by humans. It is one of the few species of iguanas found outside of the New World and one of the most geographically isolated members of the family Iguanidae. Populations of these iguanas have been declining over the past century due to habitat destruction, and more significantly, the introduction of mongoose and house cats to the islands. The Jamaican iguana is a large species of lizard in the family Iguanidae. The species is endemic to Jamaica. It is the largest native land animal in Jamaica, and is critically endangered, even considered extinct between 1948 and 1990. Once found throughout Jamaica and on the offshore islets Great Goat Island and Little Goat Island, it is now confined to the forests of the Hellshire Hills. The rhinoceros iguana is a threatened species of lizard in the family Iguanidae that is primarily found on the Caribbean island of Hispaniola, shared by the Republic of Haiti and the Dominican Republic. They vary in length from 60 to 136 centimetres and skin colours range from a steely grey to a dark green and even brown. Their name derives from the bony-plated pseudo-horn or outgrowth which resembles the horn of a rhinoceros on the iguana's snout. Ctenosaura bakeri, also known as the Utila iguana, Baker's spinytail iguana, swamper or wishiwilly del suampo, is a critically endangered species of spinytail iguana endemic to the island of Utila, one of the Islas de la Bahía off the coast of Honduras. The northern Bahamian rock iguana is a species of lizard of the genus Cyclura that is found on the Andros and Exuma islands in the Bahamas. Its status on the IUCN Red List is Vulnerable, with a wild population of less than 5,000 animals. The Cuban rock iguana, also known as the Cuban ground iguana or Cuban iguana, is a species of lizard of the iguana family. It is the largest of the West Indian rock iguanas, one of the most endangered groups of lizards. This herbivorous species with red eyes, a thick tail, and spiked jowls is one of the largest lizards in the Caribbean. Cyclura ricordi, commonly known as the Hispaniolan ground iguana, Ricord's ground iguana, Ricord's iguana, or Ricord's rock iguana, is a critically endangered species of rock iguana. It is found on the island of Hispaniola, and is the only known species of rock iguana to coexist with the rhinoceros iguana. Its natural habitat is dry savanna within three subpopulations in the southwestern Dominican Republic. It is threatened by habitat loss due to agricultural encroachment. Cyclura rileyi nuchalis, commonly known as the Acklins ground iguana or Watling Island iguana, is an endangered subspecies of lizard of the genus Cyclura it is one of three subspecific forms of Cyclura rileyi in the family Iguanidae. Cyclura rileyi, commonly known as the Bahamian rock iguana or the San Salvador rock iguana, is a critically endangered species of lizard native to three island groups in the Bahamas. The species is in decline due to habitat encroachment by human development and predation by feral dogs and cats. There are three subspecies: the Acklins ground iguana, the White Cay iguana, in addition to the nominotypical subspecies. The Lesser Caymans iguana, also known as the Cayman Brac iguana, Cayman Island brown iguana or Sister Isles iguana, is a critically endangered subspecies of the Cuban iguana. It is native to two islands to the south of Cuba: Cayman Brac and Little Cayman, which are also known as the Sister Isles due to their similar shapes and close proximity to each other. This subspecies is in decline due to habitat encroachment by human development and predation by feral dogs and cats. It is nearly extinct on Cayman Brac, and Little Cayman supports a population of about 1,500 animals. The Allen Cays rock iguana or Allen Cays iguana is an endangered subspecies of the northern Bahamian rock iguana that is found on Allen's Cay in the Bahamas. Its status is Endangered, with a wild population of 1,000 animals, and it can be found on the IUCN Red List. The Exuma Island iguana is a critically endangered subspecies of northern Bahamian rock iguana that is found on the Exuma island chain in the Bahamas with a wild population of 1,300 animals, it is listed on the IUCN Red List. Cyclura rileyi cristata, commonly known as the White Cay iguana or Sandy Cay rock iguana, is a critically endangered subspecies of lizard of the genus Cyclura native to a single cay in the Bahamas: White Cay located in the Southern Exumas. Cyclura is a genus of lizards in the family Iguanidae. Member species of this genus are commonly known as "cycluras" or more commonly as rock iguanas and only occur on islands in the West Indies. Rock iguanas have a high degree of endemism, with a single species or subspecies restricted to individual islands. The Anegada ground iguana or stout iguana is a critically endangered species of lizard of the genus Cyclura belonging to the family Iguanidae. The species can be found exclusively in the islands of Anegada and Guana. Historically, it inhabited the islands of Puerto Rico and Saint Thomas, however, the animal's original range has been greatly diminished. The green iguana, also known as the American iguana, is a large, arboreal, mostly herbivorous species of lizard of the genus Iguana. It is native to Central America, South America, and the Caribbean. Usually, this animal is simply called the iguana. The green iguana ranges over a large geographic area, from southern Brazil and Paraguay as far north as Mexico and the Caribbean islands. They have been introduced from South America to Puerto Rico and are very common throughout the island, where they are colloquially known as gallina de palo and considered an invasive species; in the United States feral populations also exist in South Florida, Hawaii, the U.S. Virgin Islands and the Rio Grande Valley of Texas.